There were no cooking classes during the summer. Our projects included adding significantly more vegetable planting area, more compost piles and installing two 500 gallon cisterns to harvest rainwater from the roof. This helped us during our summer of low rainfall, and we were able to harvest enough vegetables for almost all of our meals. We now have a new small tractor, named Anna, in honor of Lenore’s hard-working mother, and “she” is helping Joe with the work around our homestead. We are enjoying the fall squashes, parsnips, and burdock and have the greens and lettuces growing, ready for their protective hoop covering when the cold weather comes. The schedule for fall cooking classes is set and we hope to see you at a class soon. From the vegetarian staple, tofu, to “What to do with fall vegetables?”, to a delicious new soups class, there is something for everyone. We welcome Laura Marsico, Jason Pierson and Bobbie Jo Pillmore back as assistants! We are sorry to report that the local natural food store, Nature’s Nectar, is closing its doors. The store is at 235 Weaverville Road, Woodfin, NC 28804, (828) 645-0403, www.naturesnectar.net. Through September, they are offering 25% off on grocery items and 20% off on health and beauty items. Gloria would appreciate any support you can give during this sale period. Those of you who have been in my kitchen, know that I use and recommend Ball jars for storage. Recently I have been using a small blender which attaches directly to mini- or pint-size jars. 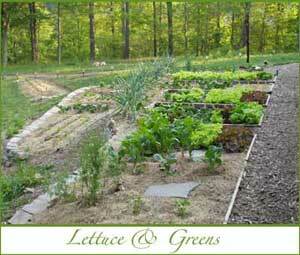 I have prepared salad dressings, smoothies, ground seeds, nuts and spices, small quantity batches, etc. You can blend ingredients right in the Ball jar and when you’re finished, put a cap on it for short or long term storage. It could be used for freshly ground coffee. The glass jar cleans up so easily and more thoroughly than plastic containers. They offer a travel case, and I can’t wait to use it during our next trip. If you incorporate living foods in your diet, it would be perfect for you on the road, too. I highly recommend the Tribest Model PB#200 or the newest Model PB#300 Personal Blender. 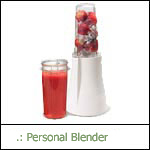 See what you think at www.personalblender.com. Consumer demand has driven companies to meet our needs. You can now get compact fluorescents in spotlights and dimmable varieties. Greenlite, Westinghouse, Maxlite and GE have recently started manufacturing dimmable CFLs and CFLs designed for use with three-way switches, so your entire house can now glow with the warm, eco-friendly hue of CFLs. Visit www.thegreenguide.com/blog/freshfinds/340 for more information. While it is always more energy wise to shut off incandescent bulbs whenever they are not in use, flourescent bulbs need to be treated differently. The life of the flourescent bulb is reduced by turning them on and off frequently and they take more resources to manufacture than incandescent bulbs. As a general guideline, it is better to turn them OFF only if they’ll be OFF for more than 15 or 20 minutes. Proper disposal of fluorescent bulbs is very important. Because they contain mercury, please do not throw them into the trash. Check your local recycling sources to find their recommendations or visit http://earth911.org for options. Here in Buncombe County, the fire stations collect used fluorescent bulbs for proper recycling. Lenore wrote an article “Soup’s On” for the September issue of The New Life Journal. You can still pick up a free copy around the Asheville area or visit www.newlifejournal.com for a look and several recipes. Healthy at 100 strives to improve both the quality and the quantity of our remaining years, no matter how old or how healthy we might currently be, and to reverse the social stigma on aging. It starts with an examination of long-lived peoples who lead happy, vital, disease-free lives through their 100th birthday, quite a different picture from what most of us expect from aging. After reading this book, we will never think about age or life in the same way again. Both Joe and I found it a very engaging read with easy to “digest” information.